The city of Guadalajara presents an interesting combination of traditional and modern: although it's sometimes referred to as the "Mexican Silicon Valley" because of its technological industries, it's also a bastion of Mexican culture. This is the second largest city in Mexico, the capital of Jalisco state, and also the birthplace of both mariachi and tequila. A visit to Guadalajara presents the opportunity to see colonial and modern architecture, listen to mariachi music, shop for handicrafts, sample regional cuisine — don't forget the tequila! — and so much more. 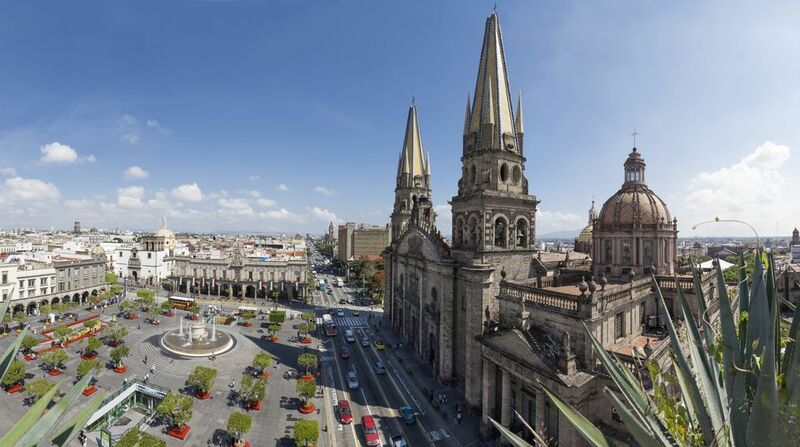 Upon arrival in town, one of the first things to do is to take a walking tour of the Guadalajara city center. This will help you get to know the lay of the land and allow you to learn about some of the area's fascinating history. Be sure to see the cathedral, the Plaza de Armas and Government Palace, which has a small history museum, and the Rotunda de los Jaliscenses Ilustres which pays tribute to important people from the state. The city has many lovely squares and parks for you to take a break during your explorations. There are many foods that are traditional to this region of Mexico, but one of the most emblematic is the torta ahogada, a "drowned sandwich" that consists of a crusty bun stuffed with marinated pork meat and covered in a spicy salsa made with tomato and chile de arbol. A few other dishes to sample on your visit include birria (a hearty, spicy goat stew), corn pozole, and of course, tacos. Mariachi music originated in Guadalajara and there's no better place to enjoy the quintessential sound of Mexico than in its place of birth. Although you're likely to come across musicians as you explore the city, be sure to make a stop at the Plaza de los Mariachis for a drink and a chance to hear some traditional music. Request the song "Guadalajara" so you can have the full experience (mariachis charge by the song, so have some pesos ready to pay). Besides mariachi music, you may enjoy seeing some traditional Mexican folk dancing. You've probably heard of the "Mexican Hat Dance," which in Spanish is known as the Jarabe Tapatio, and is traditional to Guadalajara, but that's just one of the many different types of folk dances you can see. The Guadalajara University's folk dance troupe, the Ballet Folklorico performs regularly at the Teatro Degollado in the center of town and is a wonderful experience for anyone interested in Mexican culture. The Cabañas Cultural Institute is a UNESCO World Heritage Site. Designed by architect Manuel Tolsá and built at the beginning of the 19th century, the building was named for Bishop Juan Cruz Ruiz de Cabañas, who commissioned the project. This is one of the oldest and largest charitable complexes of New Spain. It was originally designed to function as an orphanage as well as a home for the aged, the infirm and the destitute. In the early 20th century, the chapel was decorated with a series of murals. The building was previously known as (and still often referred to as) the Hospicio Cabañas. In 1980 the building ceased to function as an orphanage and since that time has been used as a cultural center and museum. Besides its permanent collection, the Cabañas Institute also displays temporary exhibits and is open Tuesday through Sunday from 10 a.m. to 6 p.m., closed Mondays. In the 1930s, the government of the state of Jalisco invited the artist Jose Clemente Orozco to paint murals in the government palace and on the walls of the main chapel area of the Hospicio Cabañas, which he did between 1936 and 1939. Orozco painted two murals in the Guadalajara government palace. The one in the main staircase shows Miguel Hidalgo, a priest and the father of Mexican Independence who issued a decree abolishing slavery in Mexico, brandishing a fiery torch at shadowy figures representing oppression and slavery. There are 57 frescoes painted by Orozco in the main chapel of the Cabamas Institute. The most impressive of the murals are in the chapel's cupola. Called El Hombre de Fuego ("Man of Fire"), the central figure is a man ascending in flames, surrounded by figures in shades of grey representing the natural elements. Along with Diego Rivera and David Alfaro Siqueiros, Orozco is considered one of the three greats of the Mexican Muralism movement which lasted from the 1920s through 1950. Orozco's Man of Fire is considered by many to be a masterpiece of 20th-century mural painting. Guadalajara is also home to one of the largest traditional markets in Mexico, so you should definitely take the opportunity to visit the Mercado Libertad, take your time browsing and maybe purchase a souvenir or a snack. You'll find a large selection of goods including handicrafts, clothes, shoes, flowers, produce, leather goods, traditional candies, electronics, household items, and food stalls. Designed by architect Alejandro Zohn, the market was inaugurated on December 30, 1958. It's open from 6 a.m. to 8 p.m. daily. The nearby town of Santiago de Tequila is where the well-known drink originated. Just 60 miles west of the state capital, you can see blue agave fields stretching on as far as the eye can see, visit the "magical town" of Santiago Tequila, and learn how tequila is made. Besides learning about the production process at some distilleries, you can make a stop at the church on the main square and wander the town's cobblestone streets.